We made it to Florence in time for a fun afternoon. 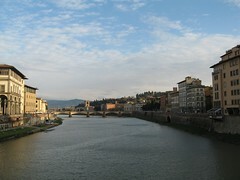 We did Ponte Vecchio (where this photo was taken). Hit up an amazing chocolate shop called Vestri. And did a museum and a stroll down the shopping district as night was falling.